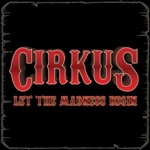 I've got to give them credit, Cirkus tries to rock out on their first full length album, 'Let The Madness Begin.' Hailing from Sweden, Cirkus has had three successfull EPs in as many years. They like to claim an historic and impressive bloodline from Led Zeppelin to The Clash to Aerosmith to Guns N' Roses. That's a pretty ballsy bravado, if you ask me. But can they pull it off? Frankly, except for a few songs, the music on 'Let The Madness Begin' is quite tame, almost castrated of energy. After one listen, I wanted to rename this album 'Let The Boredom Begin.' But this is unfair, so read on. Cirkus' 'Let The Madness Begin' is another debut work which I could file some where between a musical oddity and curiousity. It was interesting, even enjoyable, in its better moments, but still not quite the hard rockin' work I expected. On a positive note, I can say that Cirkus has some true talent in musicianship and song composition. Though Cirkus didn't reach me this time, I'll be looking forward to future works. Cirkus' 'Let The Madness Begin' is another debut work which I could file some where between a musical oddity and curiousity. It was interesting, even enjoyable, in its better moments, but still not quite the hard rockin' work I expected.